This is Way Yan. I don’t think I’ve blogged about him before. The country is one of the poorest nations in southeastern Asia, suffering from decades of stagnation, mismanagement and isolation. Burma’s GDP grows at an average rate of 2.9% annually â€“ the lowest rate of economic growth in the Greater Mekong Subregion. One could easily argue that poverty, and its dictator government, is the reason that Myanmar is pretty messed up by Malaysia’s standards. Last year there were lots of economic and anti-government protests, something we’re lucky not to have experienced here. When you think of it, we’re really lucky even compared to people in some neighbouring countries. So I think we shouldn’t complain too much if petrol prices go up a little or the price of food increases. Just deal with it. I know I could do more, but at the moment I’m doing my small part to fight poverty by sponsoring Wai Yan’s school fees, medication and food for just RM50 a month. 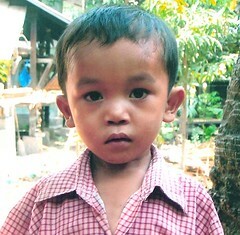 It’s been 2 years since I started sponsoring Wai Yan, so it’s been RM1,200 already–wow even I didn’t realise that. If you want to sponsor a child too, check out World Vision Malaysia’s Child Sponsorship programme. This post is my contribution to Blog Action Day 2008 (yes I know I’m late).